One of the biggest benefits of being a Professional or Advanced Professional Member of the SfEP is free entry in the Society’s Directory of Editorial Services. This online resource lists more than 600 members of the Society – the ideal place for clients to search for editors and proofreaders with a huge array of skills and specialisms. 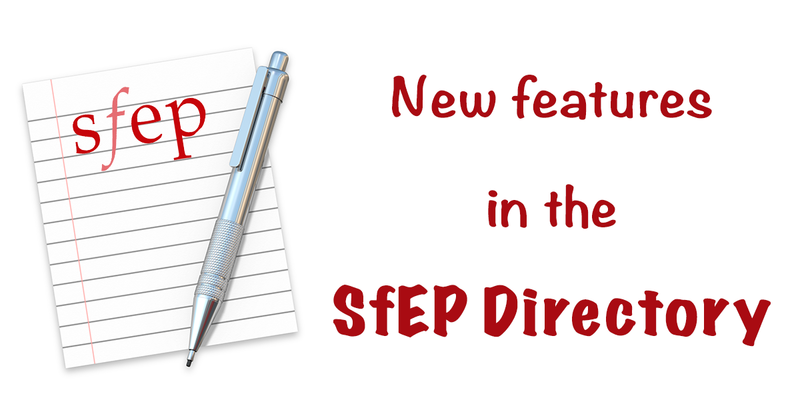 Since releasing the new version of the SfEP website at the end of 2015, we’ve been busy enhancing the Directory. In this post, I’m going to cover some new features that we think you’ll like. You can supply a larger image if that’s more convenient – we’ll handle the scaling for you. If you want a certain part of your entry to stand out, just ask for it to be your featured section. We’ll apply a separate style to that part of the entry. Featured content is usually best placed at the top of the entry. You can make your entry stand out by including recommendations from your clients. We now have a new style for displaying testimonials. Just send us the text and the name of the client, and we’ll do the rest. The Directory now supports videos, so you can display content from YouTube, Vimeo and any other video-sharing service. All we need from you is the iframe embed code. On YouTube, the iframe code can be found by clicking Share and then Embed. On Vimeo, the Share button leads directly to the iframe code. Videos are a great way to promote your services. I’ve blogged about this in another post: The rise of video in promoting editorial services. By default, we allow search engines to index Directory entries. A Google search for your name should mean your entry appears in the search results. For most members, that’s good news. But some members have told us that they’d prefer not to have their details indexed by search engines. So, we’ve added an option to hide individual entries from the bots that crawl the internet. If you want to hide your Directory entry from search engines, just let us know. You can request an update to your Directory entry by emailing online-directory@sfep.org.uk. We’re usually able to apply all changes within one working day. Just tell us which changes to make, and we’ll handle the details. If you’re a Professional or Advanced Professional Member, you can request a Directory listing via the SfEP Members’ area. If you’re an Entry-Level or Intermediate Member, take a look at what you need to do to upgrade your membership. Many members listed in the Directory cite it as one of their main sources of income. If you’re not part of the membership yet, perhaps you’ll consider joining the SfEP. I hope you’ll agree that these new features are a good start. But we want the SfEP Directory to be even better. We’re working hard behind the scenes so that you can update your own entry directly. We’ll let you know as soon as this feature is ready. But remember: you can request an update to your entry at any time – just email online-directory@sfep.org.uk to let us know. OK, that’s it for now. What do you think of the new-look Directory? Let us know by leaving a comment. We’d love to hear from you. This article was proofread by Lucy Williams. This entry was posted in Getting started on July 20, 2016 by admin.